For business, SiteSkins Unlimited offers the best value and maximum flexibility. With up to 30 pages, image uploads, custom colors, custom email boxes, custom form options, custom logo and skins as well. This is our premium package! Plus, you get top shelf support, with phone, email and chat support options included. Happily Ever After, LLC. Weddings with Style! For the smaller business, personal or family homepage, this 5 page website account is the most affordable way to have a high quality website. Perfect to show off those photos from a recent wedding, or stay in touch accross the miles. 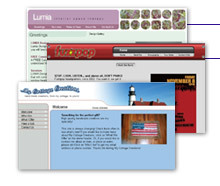 You can upgrade to the full 30 page website at any time. 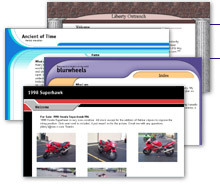 You get 5 pages for photo galleries, slideshows, calendars, feedback forms, text content, or anything you dream up. On top of that, you get email and chat support, as well as custom typesetting service on your logo! Rain Lovers - not everone hates the rain! Barry Pearl - Star from Grease! What can you do with just one page? Appearently quite a bit! Our FreePage users continuously surprise us with new and inventive ways to use a single page website. What's more, it's completely FREE*. People have used this option to create personal websites, online business cards and even sell cars! * We no longer offer the FreePage account type. © 2002 - 2011 Modomedia, Inc. All Rights Reserved.